As many of you know, major world markets have seen record losses over the last week. Chinese markets are in record decline, and the Dow saw its largest single day point drop in the history of the exchange. With the U.S. Stock Markets down about 10% all around, we are officially in a “correction.” As many of you know, this might just be the tip of the iceberg. All told, over $3 trillion of assets have been lost worldwide in a very short period of time. With that said, how is your portfolio faring in this downturn? I can tell you one thing. If you owned assets uncorrelated to mainstream markets over the last week, like the U.S. rare coins we mention in this article, I’ll bet you are breathing easy right now. Don’t let a major market downturn dictate your financial future. Diversify now! 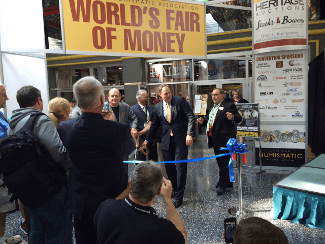 Last week I had the opportunity to attend the American Numismatic Association’s (ANA) World’s Fair of Money, in Chicago. This is the largest coin show in the U.S. and features more coins, dealers and collectors than any other show. Many of the dealers and collectors I spoke with are excited about the strong level of demand in the market. While mainstream markets might be slowing down, interest in the U.S. rare coin market is very strong right now. The Chicago ANA show was by far the best coin show of the year. While the market on numismatics has been relatively quiet thus far this year, Chicago ANA represented a turning point. We were able to obtain roughly $300,000 worth of numismatics for ASI clients and the buzz at the show was that the market is back in full swing. Dealers and coin buyers were there in force, offering many coins we would consider ideal for the Rare Coin Program (RCP). Furthermore, demand in numismatics in general was the highest we have seen in recent years. The market is strong. Moving forward, we expect the rest of 2015 to offer strong buying opportunities. Many truly rare coins are going to be available in the coming months, and it looks like we are going to be coming out of the summer doldrums with a bang following the Chicago ANA. I also noticed a lot of new faces at the Chicago ANA show. Many more mainstream investors are starting to explore the security and profit potential rare coins can provide. The principle reason rare coins offer an important alternative to equity investments is they are uncorrelated to equities, bonds or any other mainstream asset. Factors that affect your other assets do not affect rare coins. These add stability to your portfolio, shielding you from mainstream markets and even the recent volatility of the stock and precious metals markets. Despite a nearly 40-year unwavering rise in value and prices, many coin 'investors' and some ‘would-be buyers’ have been skittish about taking the plunge into rare coins. We have all seen, and many of us have purchased, beautiful, new coins from private mints or limited edition U.S. government minted coins, in elegant, velvet display boxes. They are sold as perfect condition, early releases or first strikes. They seem valuable because they are pristine with regard to color and beauty, are struck in genuine gold or silver and have a story to tell. Some might be historical, show a nature scene or depict an important event. Unfortunately, these coins are not truly rare, and you won’t realize this until you get a valuation. By then, it might be too late for your portfolio to recover. This is not a case of ‘the market went down’ or you ‘need to give the investment more time.’ It is about investing in so-called ‘rare coins’ that are not truly rare. If you find yourself with coins like these and don’t know where to go from here, we can help. ASI has a buyback program for your underperforming coin portfolio. If you are one of those investors reluctant to diversify into rare coins because of the poor performance of your existing coins, we can help. ASI offers a buyback program to help you liquidate your underperforming coins and to point you in the right direction. Buy the RIGHT coins: The ASI Rare Coin Program provides you with true rarity and portfolio protection. Balancing a portfolio with rare coins takes extreme expertise, but is well worth it to do so. That is why ASI has created the Rare Coin Program with renowned expert, Douglas Winter. Doug is considered one of the world’s leading experts on rare coins, specializing in pre-1933 U.S. rare gold coins and is a contributor to some of the most influential U.S. Rare Coin Guidebooks to date. Doug and ASI are here to help you avoid the rare coin pitfalls that less experienced buyers can fall into. To see a list of rare coins that you can add to your portfolio right now, click here. Whether you need to reposition or would like to begin protecting your portfolio with rare coins, call ASI at 877-340-0790 and speak with a Preferred Client Relations representative. We have no commissioned sales people; we measure our staff’s success by the excellence of their service to you. Let us help. Start today. I am certain you will be glad you did.